Our comments focused on the need for a technical expert to advise the panel on how online systems work and what the implications are of tapping into them. We also expressed our concern that the NSA’s efforts to subvert encryption and to plant backdoors undermine security for everyone online. Most importantly, our comments include a number of technical questions that we feel this panel should focus on and, when possible, ask that the intelligence community provide answers. You can read the full comments here. The panel’s work was affected by last week’s government shutdown. It’s not clear how this delay will impact their timeline for a final report, if at all, but I don’t expect to hear answers to our questions soon. On July 10, I was a guest on KRCW’s daily show, To The Point. Reacting to recent revelations of NSA surveillance issues and comments made by witnesses at the Privacy and Civil Liberties Oversight Board (PCLOB) meeting on Tuesday, I talked about the need for more oversight and transparency of NSA programs by technically minded individuals that can understand the underlying technology and its implications. Listen to the show. My comments start at about 32 minutes. On July 9, I joined a few technical experts on a panel to field questions from the Privacy and Civil Liberties Oversight Board. The panel footage is available from CSPAN here, with a clip of my remarks here. A draft of my written comments is posted here. I am speaking today at the PCLOB meeting on Sections 215 and 702 of the PATRIOT Act. My panel begins at 12:30 and you can watch it live here. Improved technology enabled the NSA’s mass surveillance programs and future improvements will make collecting data on citizens easier and easier. Recent revelations about the extent of surveillance by the U.S. National Security Agency come as no surprise to those with a technical background in the workings of digital communications. The leaked documents show how the NSA has taken advantage of the increased use of digital communications and cloud services, coupled with outdated privacy laws, to expand and streamline their surveillance programs. This is a predictable response to the shrinking cost and growing efficiency of surveillance brought about by new technology. The extent to which technology has reduced the time and cost necessary to conduct surveillance should play an important role in our national discussion of this issue. The American public previously, maybe unknowingly, relied on technical and financial barriers to protect them from large-scale surveillance by the government. These implicit protections have quickly eroded in recent years as technology industry advances have reached intelligence agencies, and digital communications technology has spread through society. As a result, we now have to replace these “naturally occurring” boundaries and refactor the law to protect our privacy. My panel focused on PRISM. We discussed what the program might look like based on publicly available information as well as whether the intelligence gained through the program is worth the risk to American’s privacy. You can watch the day’s events here. PRISM Panel begins around 2:10:00. 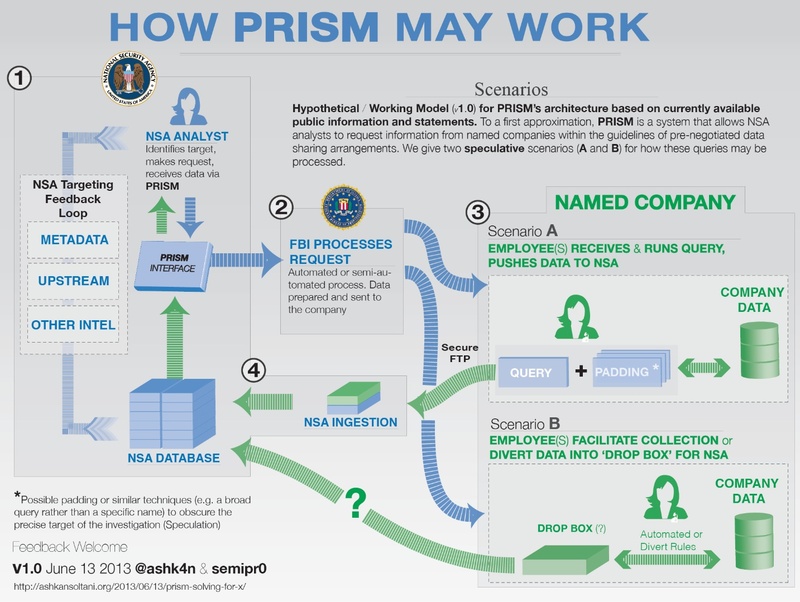 I thought it would be a fun exercise to describe PRISM based on information publicly available through the press, private companies, and the DNI. Specifically, how would this system look if we took all the statements made at face value? This might be a stretch, but it seems like a worthwhile exercise — not unlike a multivariate equation when one or more of the variables are unknown.